West Midlands Conswervatives have sent out a lovely shiny leaflet urging people to "vote for change". An interesting choice of slogan given that they're currently the largest UK party in the European Empire and a vote for change would mean not voting for them! The front of the leaflet has a picture of David Camoron in the traditional action pose - in the middle of a word, leaning over his lectern with his hand out in front of him in what was undoubtedly a sincere gesture. The inside has some newspaper headlines about the recession and Liebour's mismanagement of the economy. At the bottom it says "Tell Labour you want the referendum they promised. Vote Conservative on 4th June." 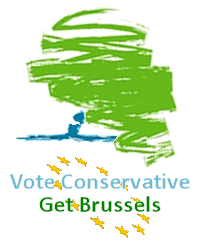 Does this mean that if you vote for the Conservatives they'll stop funding the "Yes" campaign that has been dilligently promoting the EU not-a-constitution and pressing for its ratification in the Republic of Ireland without another referendum, through the European People's Party (EPP)? Also on the inside is a table that shows the voting history of Tory, Liebour and Lib Dim MEPs on key issues. The fact that they've left out UKIP, the third pargest UK party in the European Empire, and put in the Lib Dims instead is amusing - they know that putting in a UKIP column showing that they've consistently voted against every major interference from the EU would only show potential Tory voters that UKIP is the real voice of opposition to the European Empire. The policies the Tories claim to have voted against don't even stand up to scrutiny. They claim to have voted against the EU constitution but through their eurofederalist EPP grouping in the EU Parliament, they funded the "yes" vote in the Republic of Ireland. They claim to have voted against a bigger, more expensive EU budget - a vote for UKIP is a vote against any UK contribution to the EU budget. Voting to keep the opt-out to the Working Time Directive, against an EU army, against more EU control over our legal system and against the EU's fraudulent accounts - all very tenuous claims. The Tories are in favour of ever closer union, with the ultimate objective of abolishing European nations and replacing them with a single European super-state. And when it comes to the EU's consistently fraudulent accounts - who has a better claim to be tackling them than UKIP, with the auditor that the EU (former Liebour leader, Neil Kinnock, to be exact) sacked for exposing their fraudulent accounts standing as a candidate for the party in the south east euroregion? On the back of the leaflet there's a "personal" message from call-me-Dave telling us to vote Conservative because they'll give us a referendum on the EU not-a-constitution. This isa lie - William Hague said they may give us a referendum if it hadn't already been ratified. Finally, there's a special section just for Shropshire saying the they will work for British business by cutting EU red tape. The simple fact of the matter is that they can't cut EU red tape because the UK is a tiny voice in the EU Parliament and 75% of our laws are made there. They say they will help local farmers by making sure that EU directives on pesticides don't damage farmers' food production. They won't oppose the EU's bans on perfectly safe products like UKIP have but they will try and paper over the cracks. Not good enough. They say they will fight against plans to electronically tag sheep but they are powerless to stop them if the EU's commissioner for agriculture - who comes from Greece, which isn't exactly well known for its sheep trade - issues a directive. They say they will secure EU funding for the Ironbridge Gorge world heritage site which is suffering badly from landslides and de-stablisation. If we weren't spending £40m per day net on being in the European Empire then we could fund the several million pounds worth of stablisation work needed from our own taxes and the whole are wouldn't have to be blighted with huge signs telling us how generous the EU have been with our money. The Ironbridge Gorge needs about 12 hours worth of our net contribution to the EU to fix all the problems permanently. The Conservatives leaflet is full of half-truths, outright lies and false promises. Nothing they have promised can be achieved without leaving the European Empire and as David Cameron told his party last year, there is no way the Conswervatives will be taking the UK out of the EU. So take the Tories' advice and vote for change - vote for UKIP.